What is the Fiscal Cliff? The term was first used by Federal Reserve Chairman Ben Bernanke to emphasize that without a change in current laws by the end of 2012, the economy and the nation could go back into a recession. The Congressional Budget Office (CBO) estimates that with no deal and if the current tax and spending cuts occur, the country will plunge back into recession in early 2013. The picture of the economy going over a cliff on January 1, 2013 may not be the best description. In fact, some analysts believe it would be better to call the looming crisis a “fiscal slope” or “fiscal hill” instead, because the cumulative effects of what will happen with no agreement is more like the economy moving slowly uphill instead of going over a cliff. The reality is our nation’s economy is healing but not healthy yet. Our current economic crisis brings to mind the lesson of futility illustrated by the Greek king Sisyphus. Sisyphus was condemned for his greed to roll a boulder up a hill over and over. Each time he reached the top of the hill, it rolled back down. Similarly, just as our economy is righting itself, it is plunged into a “fiscal cliff” situation that could send us right back into recession. You may recall, during the presidential campaign, former Governor Mitt Romney said the deficit grew faster under President Obama than any other president. What he did not add is spending kept the country from going further into recession. Stimulus spending, extending tax cuts, unemployment benefits, saving the auto industry, bailing out the banking and housing industries, funding two wars and extending tax cuts cost a lot of money. And now, not spending and increased taxes may take us right back into recession. The “fiscal cliff” discussions are about past agreements, in particular, an agreement made last August during the budget debates on the debt ceiling. If no deal is made the budget deficit will be cut nearly in half. But tax hikes mean less money in family households, a decline in spending, 2.2 million will stop receiving unemployment checks and the unemployment lines will grow longer because businesses will be forced to lay off workers. The Bush tax cuts that were extended by President Obama in the Tax Relief, Unemployment Insurance Reauthorization, and Job Creation Act of 2010 will expire meaning everyone’s taxes will increase on January 1, 2013. Federal unemployment benefits extended by MCTRJCA will expire affecting 2.2 million Americans. New taxes from the Patient Protection and Affordable Care Act and the Health Care and Education Reconciliation Act of 2010 will go into effect that will tax families making over $250,000 a year and individuals making over $200,000 a year. Why protect the middle class? Annually American families buy goods, services, automobiles, furniture, and as mentioned earlier during the holiday season, gifts and food. This year, Americans will spend nearly $5 trillion on retail sales. One fifth of that activity occurs during the holiday season. Tax cuts will impact this portion of the economy. Accordingly, the retail industry supports through employment 15 million Americans and has since June 2009 when the recession ended, been responsible for more than 9 percent of overall employment growth adding over 400,000 jobs over the past 32 months. Raising taxes on the middle class would impact the number of jobs, because with less income, middle class consumers will spend less money on retail. The President’s Council of Economic Advisors (CEA) tax increases will mean that nearly $200 billion less will be spent in 2013. Keep in mind, that the median family income in 2011 was $50,054, down 1.7% from the previous year and worse down 8.7% from 2007 just before the recession. 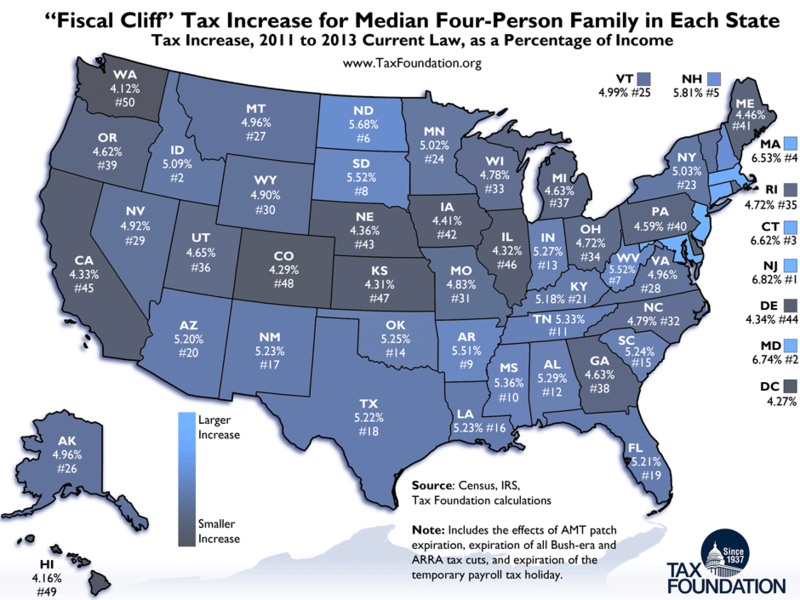 Below are examples of what could happen if tax cuts end for an average middle class family of four in 2013. Example 1: A married couple with two children earning between $50,000 and $85,000. The child tax credit will fall from $1,000 to $500 meaning this couple instead of claiming $2,000 will only be able to claim $1,000. An increase of approximately $300 because the marriage penalty relief will expire. Example 2: A single mother with three children 11 months to 6 years of age, working full time at minimum wage with an annual income of $14,500. Tax increase of $1,725, because the Child Tax Credit will go from $1,000 to $500 per child. Tax increase of $670 because the EITC expansion for larger families will expire. Example 3: An upper income married couple with a 15 year old at home and a 19 year old in second year of a public university. The couple’s income is $120,000. Tax increase of $700 because they will be unable to claim the $2,500 American Opportunity Tax Credit that helps with college expenses and only able to claim $1,800 of the Hope Credit. Increase of $500 because the Child Tax Credit mentioned above in Example 1. Tax increase of about $900 because of the merging of the 10% tax bracket. Tax increase of $2,400 with higher marginal rates and the expiration of the marriage penalty relief that allows for a larger standard deduction.